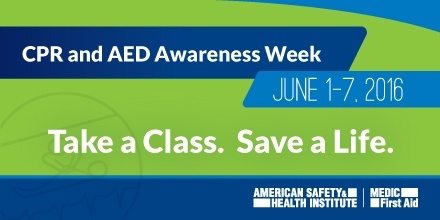 Each year, the first week of June is CPR and AED Awareness Week and, at HSI, we are all about helping people be aware of what they can do to help save a life. 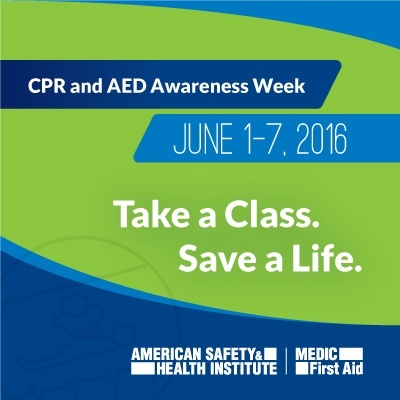 Since 2007, Congress has declared the first week in June as CPR and AED Awareness Week. With easy-to-learn CPR and easy-to-use automated external defibrillators (AEDs), we’ve got two powerful tools to encourage everyone to step up in an emergency and give a victim of Sudden Cardiac Arrest (SCA) that second chance at life. An alert and caring bystander is very often the key in a rescue situation, even before the arrival of EMS. Early intervention with CPR and defibrillation can improve survival rates, raising them as high as 60%* in some estimates. 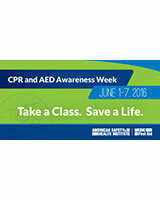 * Saving Sudden Cardiac Arrest Victims in the Workplace (Automated External Defibrillators), OSHA 3185-09N 2003. To all our ASHI and MEDIC First Aid instructors, thanks for everything you do to make learning to protect and save lives easy. Instructors of any training brand affiliation can add some fun to their next class by using our LOOP CPR skills game. LOOP is a helpful content retention tool; when learning becomes play, students practice more, and every extra chest compression done in your classroom is one more moment of muscle memory and confidence building. It would be a shame to work so hard to teach others how to save a life only to have them hold back in an emergency out of fear they just “didn’t try hard enough in that class.” A fun round of LOOP play might well encourage everyone to work in more skills practice time before leaving your classroom.